The Sky Series Graphics line aims to power the visuals of cloud servers near you. Even though cloud gaming hasn't quite received the attention its proponents hoped, it nonetheless remains a fascinating technology. Perhaps its most interesting feature is the ability to eliminate user hardware requirements, or at least drastically lower them, since all graphical processing occurs in the cloud before arriving at your system. That puts the onus on cloud gaming companies to provide high-quality visuals, an increasingly difficult task with each server streaming for large audiences. For that reason, AMD has revealed a new line of Sky Series Graphics cards designed for running multiple games at any given moment. 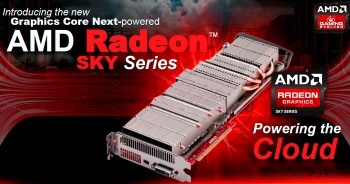 Sky Series cards are AMD's way of accounting for streaming performance and latency on top of overall graphics quality. Each card reportedly supports six 720p resolution streams at up to 30 frames per second, which is on par for console performance this generation. "Real-time gaming through the cloud represents a significant opportunity," said senior director of AMD Professional Graphics David Cummings, "and AMD is poised to lead in this vertical thanks to our extensive graphics hardware and software capabilities. AMD is working closely with CiiNow, G-Cluster, Otoy and Ubitus to deliver exceptional AMD Radeon gaming experiences to the cloud." Unless you're an MMO gold farmer running multiple accounts, these cards probably won't be seen in your average computer built. That said, the technology would be a huge boon to cloud companies, especially if the industry intends to cut down hardware requirements while maintaining high visuals. Broadband coverage probably won't be widespread enough to determine their impact for some time, but at the very least Sky Series should give AMD a leg up in the cloud gaming market.